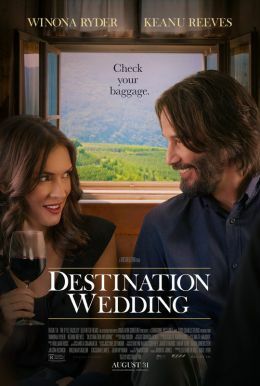 DESTINATION WEDDING reunites two of Hollywood’s most adored stars, Keanu Reeves and Winona Ryder, as the socially awkward Frank and Lindsay. When they meet on their way to a destination wedding, they soon discover they have a lot in common: they both hate the bride, the groom, the wedding, themselves, and most especially each other. As the weekend's events continually force them together – and their cheerlessness immediately isolates them from the other guests - Frank and Lindsay find that if you verbally spar with someone long enough, anything can happen. When debate gives way to desire, they must decide which is stronger: their hearts or their common sense.